Deep-sampled Bluegrass fiddle recorded in Clay City, Kentucky by Grammy nominated multi-instrumentalist Ronnie Stewart. 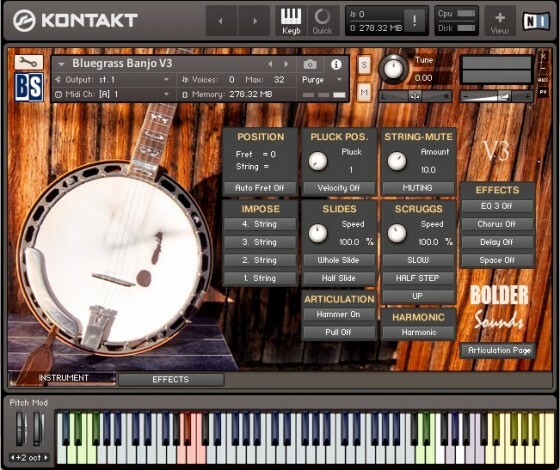 Playable multi-sampled instrument with 12 standard articulations and 14 traditional Bluegrass ornaments. Over 400 Phrases & FX including rhythmic loops and free-form improvisations. 2 types of sampled legato. 4 performance modes including customizable Double Stops. Scale Lock feature automatically selects ornament intervals in the key of your song. TACT (Total Articulation Control Technology). 1.3 GB of content - 3.435 samples (24-Bit/44.1kHz - NCW). Crescendo (short & long, tempo synced). Bend Up Fast (HT, WT). Bend Up Slow (HT, WT). Bend Down Fast (HT, WT). Bend Down Slow (HT, WT). Turn (HT, WT, Min3, Maj3). Bend Up Unisons (HT & WT, Fast & Slow). Dynamics, Width and Timbre controls. Rebowing & Open Notes controls. Per sample controls for volume & tuning. For phrases that conform to tempo. Start & End sliders to adjust loop length.